*This item is a result of a GM Event. Also given at a GM event on Povar for good roleplaying. There are better ways to become a gnome that are free and not temporary that every class can use... Dig around a little and grab one. It takes about 2 mins to do. Clickable from inventory by any class? Can you use this in your inventory by any class like you can with the dark elf mask? 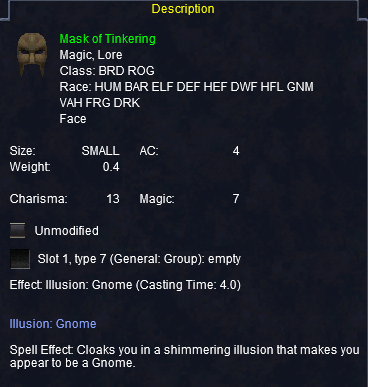 Does this allow you to create Gnome create-able only items while under the illusion?